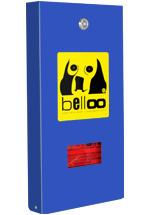 Our belloo-luca is a compact bag dispenser that is primarily designed for locations where enough litter bins have already been installed. 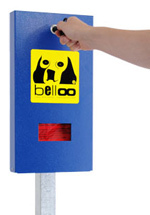 Especially in urban areas the belloo-luca is very popular. 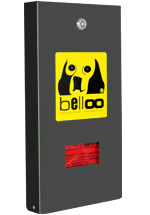 The belloo-luca can easily be installed everywhere. It is available in different colours. So, it is up to you if you wish your bag dispenser to appear in a strong blue, an elegant anthracite or rather in a classic green. 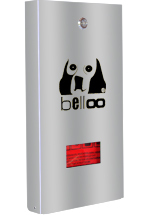 Perhaps you also like your bag dispenser made of exclusive stainless steel. Thanks to our carefully selected range of colours we are sure that you will find the adequate belloo-luca for your municipality / town. 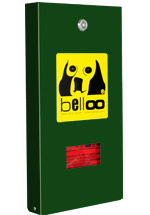 Our belloo-luca bag dispenser can be refilled very easily: Unlock it with the key and tilt it forward up to the stop and refill it with new dog waste bags. 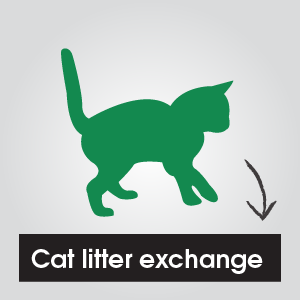 In order to refill the dispenser, new bags can be placed inside in packs at any time. 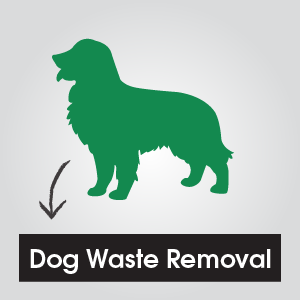 There is no need to wait until the last bag is extracted. Herewith, it is prevented that the dispenser suddenly is empty. The standard square post is concreted into the ground. The bag dispenser is screwed onto the post. (Screws will be delivered with the post). The post is bolted to the flooring surface. The anchor bolts are to be chosen depending on the characteristics of the flooring surface. (Anchor bolts for the flooring surface are NOT included in the scope of supply). The bag dispenser is screwed onto the post. (The screws for the bag dispenser will be delivered with the post). The bag dispenser can be fixed on any existing round post over Ø 50 mm with the help of pipe brackets (Art. N° 255.65 or 255.70) and a screw pipe clamp (Art. N° 255.63, set of 2 units). Pipe brackets and screw pipe clamps can be ordered as accessories. 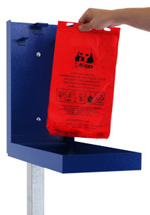 The bag dispenser can be fixed on any wall without an additional mounting. The screws are to be chosen depending on the characteristics of the wall. (Screws for wall fixing are NOT included in the scope of supply). 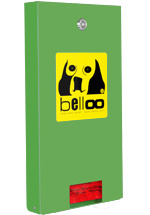 Our belloo-ofta is the previous model of our belloo-luca with the difference that the bags are pulled out downwards. 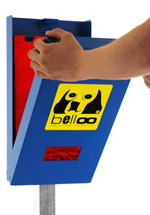 However, we only recommend it to those clients who already have belloo-oftas in their towns/ municipalities and who wish to purchase this dispenser. 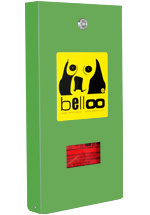 Otherwise our belloo-luca might be the more suitable model, yet it provides economical bag extraction due to its small opening and therefore is safer from vandals. 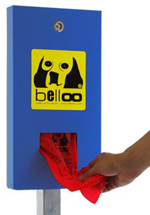 Our belloo-ofta bag dispenser can be refilled very easily: Unlock it with the key and tilt it forward up to the stop and refill it with new dog waste bags. 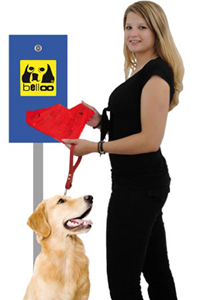 In order to refill the dispenser, new bags can be placed inside in packs at any time. There is no need to wait until the last bag is extracted. Herewith, it is prevented that the dispenser suddenly is empty. The bag dispenser can be fixed on any existing round post over Ø 50 mm with the help of pipe brackets (Art. N° 255.65 or 255.70) and a screw pipe clamps (Art. N° 255.63, set of 2 units). Pipe brackets and screw pipe clamps can be ordered as accessories. We are proud supporters of K9 Rescue Remedy. A support group to help owners of rescue dogs to understand their dogs behavior and encourage responsible and rewarding rescue dog ownership.